Finds the edges within the Matte clip, and blurs the Source clip at those edges. Use the Show Edges option to view which areas will receive the blur while adjusting the edge parameters. Then adjust Blur Width to control the amount of blur. Edge_Src: The clip used to determine the edge locations where the Source should be blurred. Only the brightness value of this clip is used. Blur Width: Default: 0.02, Range: 0 or greater. The width of the blur. This should normally not be much greater than the Edge Width. This parameter can be adjusted using the Blur Width Widget. The width of the edge area to blur within. Edge Strength: Default: 0.5, Range: 0 or greater. 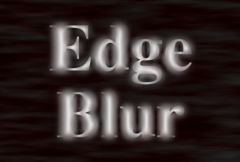 The strength of the edges determines the amount of the blurred source that replaces the edges. Edge Threshold: Default: 0, Range: 0 or greater. Determines which edges are blurred. Increase to remove minor edges or speckles. Result: outputs the Source image with blurred edges. Edges: outputs only the edge image. This can useful during the adjustment of the edge parameters. Enables blurring by subpixel amounts. Use this for smoother animation of the Blur Width or Edge Width parameters.